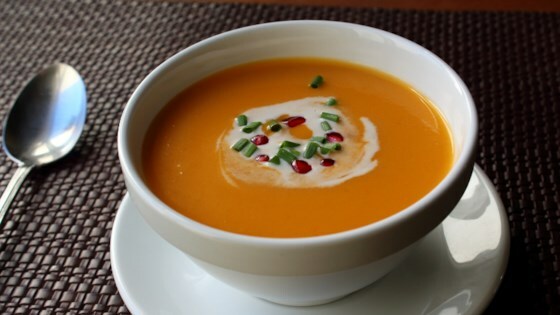 "For a winter special occasion or just a weekday meal, this butternut bisque makes a perfect, warming starter course. The snipped chives and pomegranate garnishes add a festive touch, but you can also use crumbled bacon and a swirl of crème fraiche." Melt butter in a pot over medium-low heat. Add onions and a large pinch of salt. Cook and stir until onions have softened but not taken on any color, about 10 or 15 minutes. Cut off ends of squash. Carefully cut squash in half lengthwise and remove the seeds. Peel the squash with a vegetable peeler. Cut into chunks. Raise heat under pot to medium-high. Stir in tomato paste; cook and stir until mixture begins to caramelize and turn brown, about 2 minutes. Add squash, chicken broth, 1 teaspoon salt, and cayenne pepper. Bring to a simmer; reduce heat to medium-low and simmer until squash is very tender, 15 to 25 minutes. Reduce heat to low. Blend with an immersion blender until very smooth. Stir in cream and maple syrup; add more salt if needed. Ladle into serving bowls. Garnish with a swirl of cream, and a sprinkle of chives and pomegranate seeds. If I'd intended this bisque to be a main course, I would probably have roasted the squash first. When you roast butternut squash, you caramelize and concentrate the flesh, and get something sweeter, starchier, and richer. That's perfect if you're enjoying it as a meal, but maybe not such a great thing if it's going to be followed by additional courses. If you don't have an immersion blender, you can blend the squash mixture in batches in a regular blender. Just be careful not to burn yourself. The soup was ok, but I feel the onion is over powering it. Are there any suggestions to cut the onion flavor other than using less onion? Best recipe I’ve had for butternut bisque! I didn't have any heavy cream so I used the almond milk I had on hand and served it with a dollop of sour cream. Very delicious. Made exactly as is but with a tablespoon of brown sugar added as well. Amazing. Garnished with pomegranate seeds made it so good. Will make again. This soup is quickly becoming my wife's favorite. Very tasty!